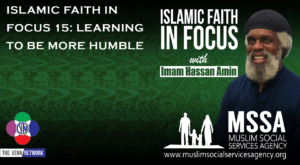 On this week’s Islamic Faith in Focus podcast with Imam Hassan he talks about what it means to be humble. In the world today, we have leaders that are not very humble, in fact some of our world leaders are prideful. It is for that reason that this lesson in being humble is not specifically for Muslims; this applies to non-Muslims as well. Siting these verses the Imam points out that the Quran itself encourages us to be humble in the sight of our Lord. Imam Hassan goes on to point out that the Quran reminds us to humble ourselves, not only to the God, but to our parents as well. Tune in to this amazing podcast to hear the rest of the lesson and learn how to be a little more humble. Don’t forget that we are introducing the new Venn Network t-shirt, which you can own by heading over to Amazon.com. When you buy one of these shirts you help, not only support the network, but you also help support the hosts. The Venn Network is growing, and it is only with support from listeners – like you – that we can reach those in need of hearing our message! Make sure to subscribe to this Venn Network production – Islamic Faith in Focus with Imam Hassan. This is surely one of the best podcasts to if you are looking for facts about Islam and if you want to know what Islam is all about. Islamic Faith in Focus Podcast delivers important information about Islam to you weekly, so make sure to subscribe to this Muslim Talk show that isn’t just for Muslims!